A tall, refreshing glass of ginger ale is a fantastic drink and it's surprisingly easy to make at home. Ginger ale is, quite simply, carbonated water sweetened and flavored with ginger-flavored syrup. That really is it and it's one of the easiest homemade sodas you can mix up. If you are a true fan of ginger ale, you'll also find that this is more economical than store-bought options. The syrup in this recipe uses a good amount of fresh ginger along with a little lemon peel, which gives it a nice kick. Beyond that, it's as simple as boiling water and dissolving sugar, so this is something anyone can pull off. Once you have the syrup, all you have to do is add cold club soda and your ginger ale is ready. This recipe is a great springboard for so many beverages both alcoholic and non-alcoholic. In a 4-quart saucepan, place ginger, lemon peel, and water. Bring to a boil over high heat. Reduce heat and simmer at a low boil, uncovered, for about 10 minutes. Add sugar, stirring constantly, and continue to boil until reduced to about 3 cups (about 15 minutes). Place a fine wire strainer over a large bowl. Pour in the ginger syrup to separate the solids from liquids. Discard the lemon peel. The strained, cooked ginger pieces can be reserved for other uses like vanilla ice cream or yogurt if desired. Allow the ginger simple syrup to cool before pouring into a glass container. Seal it tightly and chill at least 1 hour until it's cold. You can also store it for up to one week in the fridge. 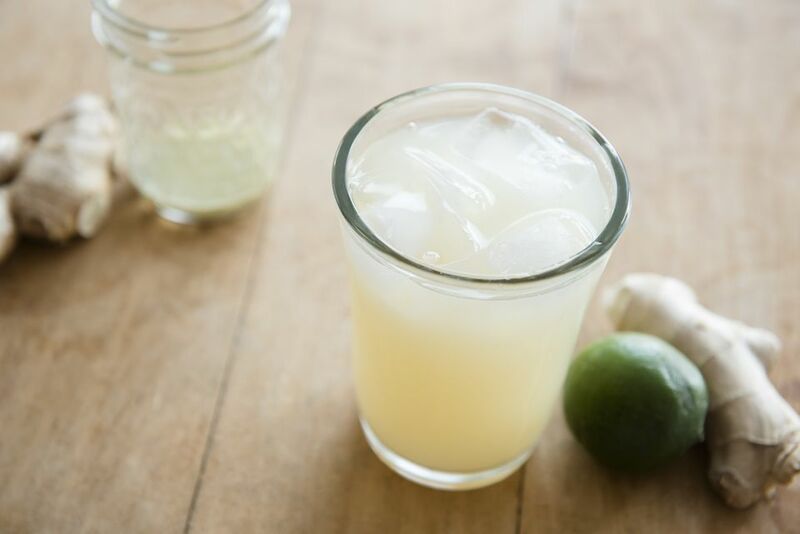 When ready to serve, for each 16-ounce serving, mix 1/4 cup ginger simple syrup with 1 cup cold club soda and pour over ice. Additional ginger syrup or sugar may be added to sweeten it to fit your taste. Seltzer and sparkling mineral water are essentially the same as club soda, though the latter has a few mineral additives. So, feel free to sub any unflavored carbonated water for the same result. Avoid using actual sodas, like Sprite or Pepsi, in place of the club soda, as this defeats the purpose of making your own ginger ale and the end product will be much too sweet. Use your ginger syrup to sweeten other beverages like hot or iced tea or to spice up a cup of hot cocoa. Ginger simple syrups are a crucial ingredient to many spiked drinks, too, like this spin on the Moscow mule or a German Jägermeister cocktail. Pair it with rum for a Mad Hatter's Tea Party or with tequila for an Office Party shooter. Add dimension to your ginger syrup by including herbs and spices. Try adding fresh mint leaves or a cinnamon stick to the boiling water, alongside the ginger and lemon. Cut the white sugar in half and substitute brown sugar for the other half to create a rich syrup with a warm winter feel.